Cheap but not so cheerful, ViewSonic’s V3D241wm may offer decent hardware, but frankly it was difficult for us to tell through iZ3D’s buggy software. Hopefully these issues will be ironed out soon, but until then this is not a 3D display we can recommend. True and Sad!!! in the same time… I can see some slacking even for nVidia…the said something like: “We are going (and try) to release a new driver with profiles at least every month” February is almost over and still no profile updates…for games like Dead Space 2…but I got a Guild Wars 2 profile….Now how is that helping me? What I want to say..is that even they are starting to be sloppy…which is not very good… Btw what was the latest 3D vision ready title? and when will be the next one released? anyone knows?….exactly my point.. I really HOPE they will not brush 3D under the rug again like it happened some years ago… Really hope so…As for AMD ( and I am a BIG FAN OF AMD CPU’s not ATI) I think they are laying low…and wait to see how the market is developing….as does nVidia with 3D Vision Souround… This being the case I am looking forward to Dragon Age 2 ( demo out today and downloading). Bloody you should try and make a review for it or are you waiting for the final version ( 11th March in EU)? iZ3D’s buggy software? I have enjoyed the IZ3D Drvier for years without problems! And it has even shortcuts for 3 presets which 3D Vision doesn’t have (very useful for cutscenes). as the AMD does not support stereoscopic hardware, namely there is no eye sync output from ATI cards. As explained earlier the nVidia and Microsoft would not let any competition to have direct access to DirectX 3D pipeline. So it is all third party hack-ware based and limited to few game titles. -it shares it’s output with a backup non-HD3D based output (120Hz shutter has a buggy software mode in case HD3D fails to initialize) so you don’t know whether or not you are using the HD3D output or not. -it has no protection on the output compatibility : if the game mistakenly tries to output 1080p60Hz, the iZ3D driver will ask HD3D to output frame-packing 1080p60 (1080p 120Hz through hdmi1.4), whether or not the graphics card and/or the display actually supports it, which leads to crashes and/or black screens. Many users are surprised by this behaviour and regularly ask for help in the iZ3D forums. The iZ3D software is very powerful but it’s not beginner friendly, it’s the main weakness of the iZ3D driver. Let’s hope they get it right for their next driver update. HDMI 1.4a does not output eye sync for any shutter glasses or IR emitter. ATI does provide drivers to output games via Hdmi 1.4. ATI does not provide drivers to transform 2D games into 3D : that is what iZ3D, DDD, Nvidia 3D-Vision and Nvidia 3DTV Play are doing. Stereo driver contains full stereoscopic camera control. Current desktop monitors do not support HDMI 1.4 and does not come with glasses. If you are stack with AMD that is no reason why everyone else should face the same problems. I have two ATI display adapters and both back in original boxes waiting to be sold with loss at eBay. I agree that AMD doesn’t seem to do anything to put some decent monitors on the market. Obviously I have not tried AMD HD3D since there is not compatible monitor for it. However we should also consider there may be a chance for DDD Tridef to perform better. My main driver is DDD however I have tried IZ3D and I have found that is ome games may perform a little better. I use Edimensional glasses which to me is the best option to go for 3D since it is extremely cheap and the 3D is still on development so who knows if Nvidia 3D vision or Bit Cauldron or AMD will set a universal standard for it. My Asus VW266H can run up to 85Hz but 60HZ is ok for me. 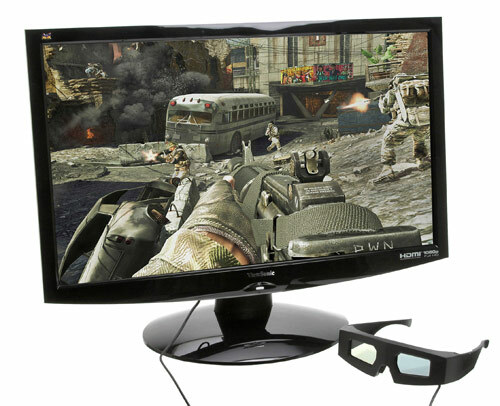 In my opinion the only reason why I would buy this monitor is to get rid of the interleaved method that Edimensional picked for their glasses which I think it will enhance for much my 3D experience. By the way I use wired glasses, I want them always on and always available, it is enough frustration when my keyboard stop to respond for battery replacement.